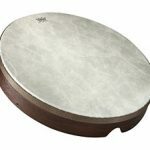 Riq Tambourine, 9″ x 2-5/8″ Fiberskyn3 drumhead. Designed by Layne. Remo signature artist Layne Redmond designed this tambourine, based on traditional instruments but with Remo’s modern touches including Acousticon synthetic shells and the Fiberskyn® 3 pre-tuned drumheads that are unaffected by weather. Riq- 2-5/8 inches by 9 inches. Pretuned to a very high pitch, with 5 double rows of heavy brass jingles for a lively and vibrant sound. Ideal for Middle Eastern music. This is the heaviest of the three tambourines that Layne designed for Remo. It also has the highest pitched and tightest head make it a more challenging drum to play. Recommended for professional or experienced players. Not recommended for beginners.